State of the art products from Aimtec, stocked by TME. Aimtec’s AC/DC LED driver series AMEPR30-AZ, AMEPR60-AZ, AMER90-AZ, AMER120-AZ, and AMER150-AZ all can be utilized in either a Constant Current or a Constant Voltage mode. 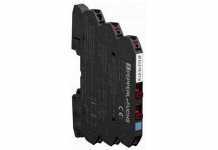 The drivers are equipped with a current limiting circuit set to the maximum rated current for the specific driver model. As a result, when a load is installed at the output of the driver that would normally result in a high current above the maximum, the current limit circuit forces the driver to operate in constant current mode. When a LED load is installed the driver will operate in Constant Current mode. The output voltage will be the total forward voltage of the LED load. The constant voltage area (horizontal line on on Fig. 1 [below]) begins from zero loading (no load current). Overvoltage protection (OVP) engages at this point and the output voltage is limited to 26.0VDC. When there is a small load current, for example 50mA, the output voltage decreases to 24.7VDC. With increased loading (decreased load resistance) the output voltage will decrease gradually. When the output current reaches the driver’s maximum of 2.5A, the output voltage will be 24VDC (Rload=24V/2.5A=9.6 Ohm). This is the point where the driver switches mode into constant current mode (B). With loading from no loading to 9.6 Ohm the driver operates as a conventional AC/DC converter. The constant current area (vertical line on Fig. 1 [below]) is the area where the output current is stable (fixed), however, the output voltage will decrease with increased loading (decreasing load resistance). For example, with Rload=9 Ohm, the output voltage will be 2.5A x 9 Ohm=22.5VDC, with Rload=6 Ohm, the output voltage will be 2.5A x 6 Ohm=15VDC. Foldback protection mode (dotted sloping line). 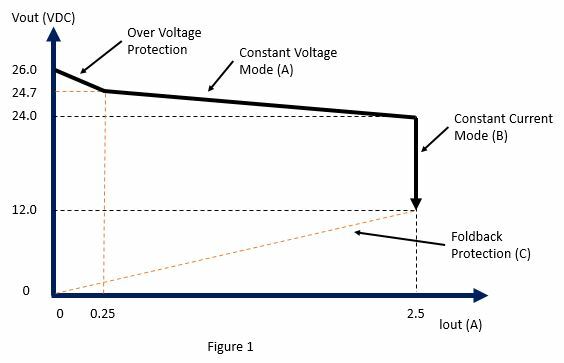 If the output current increases above the driver’s maximum rated current of 2.5A the driver’s Over Current Protection (OCP) will engage and the voltage and current will decrease rapidly. The driver will switch into this mode when the load resistance is less than 4.8 Ohm. As the current increases, the voltage will decrease to limit the output power of the driver to a safe value. Fig. 1. Operating conditions for Aimtec’s 60W AMEPR60-24250AZ. 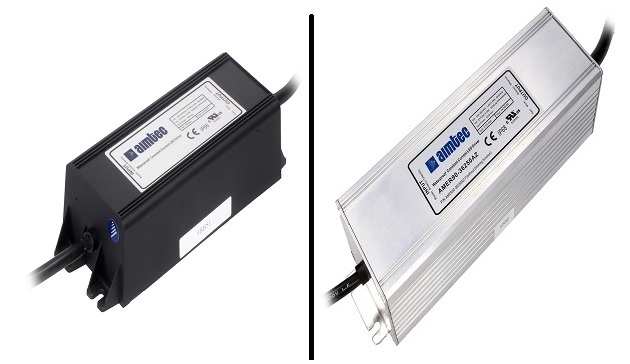 More information on Aimtec’s AC/DC LED driver series AMEPR30-AZ, AMEPR60-AZ, AMER90-AZ, AMER120-AZ, and AMER150-AZ can be found on Transfer Multisort Elektronik website, tme.eu. TME is an authorized distributor of Aimtec.